Okay, so you may remember my complaint post a while ago. Well, as promised, when I was at my local library I decided to take a peek and see if the authors of that book had anything worthwhile in their repertoire. Let me tell you, I really was giving them the benefit of the doubt. I checked out every book I could find that they collaborated on, or any books by either one on their own, or any they wrote with someone else-- at least any I could find. Let me just say, I was very very pleasantly surprised to find these little gems.. He's a pig who likes cleaning up! So clever! Little Hoot! An owl who is totally annoyed that his parents make him stay up late! 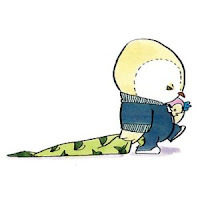 And my favorite, Little Pea-- who hates eating candy but loves his spinach for dessert! Really, I cannot say enough good things about these three "Little" books! (I may be over using my exclamation marks here. Sorry grammar enthusiasts!) Amy Krouse Rosenthal (formerly defamed on this very blog) and Jen Corace have really done something right. Granted, all three books have the same basic story line, but the twist for each book is just enough. 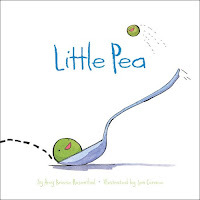 My kids must have read each of them 2 or 3 times before we even got home from the library-- I wish I could have captured the sound of shock when my seven year old read that the one thing Little Pea did not like was...CANDY. Priceless! You may or may not want to know this, but here goes-- as I was typing this very post my three year old saw that I had pulled these books out and sat over my shoulder saying, "Hurry! Hurry! Hurry!" So I would read them to her again-- if you're wondering I stopped mid-post and re-read them. Now I think Little Oink might be my favorite. Really, check them out! Oh, and I guess this just goes to show you that you can't judge a book by it's author? So, to recap- I was a jerk to Amy Krouse Rosenthal before. 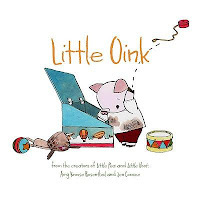 Read: Little Oink, Little Hoot, and Little Pea! I borrowed little pea from the library yesterday (the other two weren't available). It was great! Very funny, we're really enjoying it.